Indian companies are expected to offer their employees an average salary hike of 10.8 per cent this year, the highest in the Asia Pacific, and for top performers, it can be 12 per cent, says a report. "We anticipate the wage bill for companies in India to go up by an average of 10.8 per cent in 2015. Favourable economic sentiment and a comparative decrease in inflation and oil prices contribute to the real salary increase being at 5 per cent," Sambhav Rakyan, Data Services Practice Leader, Asia Pacific at Towers Watson said. In 2014, the overall salary rise was 10.5 per cent and factoring in inflation at 7.2 per cent, the real salary increase stood at 3.3 per cent. 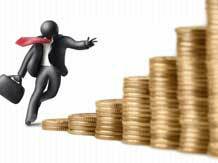 In 2015, the real salary increase is likely to jump to 5 per cent from the 3.3 per cent last year, which in turn would bring much cheer to Indian employees. "While it's too early to predict increases for 2016, the general sense is companies will budget in the same range as 2015, perhaps the net increase will be a tad lower, given the moderating inflation levels," Rakyan added. The survey noted that across all industries in India, almost 87 per cent of respondents plan to allocate a larger portion of their budget to high performers. In India, salary rise for 'highest-performing' employees averages 12 per cent, which is 30 per cent higher than 'average' performers and nearly twice the regional average. Available pointers indicate that India's moving towards pay for performance and pay for risk culture, and variable pay is likely to move up, going forward. Real salary is also expected to increase in light of decreasing inflationary pressures. "People in India still like more guaranteed base pay. This is especially true for individuals at entry to mid-level where hard cash is what they seek," Rakyan said. He added: "We do foresee a trend where a larger portion of the total compensation, as compared with current levels, would be paid as variable pay, thereby rewarding employee performance and contribution towards improved company productivity and profitability." The survey was conducted in February 2015. Some 2,000 responses were received from companies across 19 countries in the Asia Pacific.